Andy Rathbone » What’s the difference between a System Recovery disc and Windows 7’s System Repair disc? What’s the difference between a System Recovery disc and Windows 7’s System Repair disc? Q: What’s the difference between a “System Recovery” disc and a “System Repair” disc? Added as a menu option on many new PCs, System Recovery Discs come straight from your PC’s manufacturer. The manufacturer often provides an option to create these discs the first time you turn on your computer. When you click the “Create System Recovery Discs” option, you end up feeding blank CDs or DVDs into your PC. Eventually, you’ll end up with a set of discs that can restore your PC to its original purchased condition. On the good side, System Recovery Discs come in handy in an emergency. Just feed your PC the System Recovery Discs, and your PC regresses into the same machine you originally brought home from the store. On the bad side, however, you’ll lose every program, photo, and file you’ve stored on that PC since you bought it. System Recovery Discs only care about returning your PC to its original, first-purchased, condition. Everything else is swept away. Gateway, Dell, Hewlett Packard, and other vendors offer more information about their System Recovery Discs on their web sites. Most also offer ways to purchase a set of System Recovery Discs, if you’re having trouble creating them. Startup Repair. This examines Windows 7’s most integral files, then repairs any missing or damaged files that may be keeping Windows 7 from starting. System Image Recovery. If you’ve created a “System Image” in Windows 7’s backup options, this option returns your PC to the condition it was in when you made the System Image backup. It’s truly a lifesaver, but only if you create System Image disks regularly. Windows Memory Diagnostic Tool. Designed to ferret out hardware problems, this examines your PC’s memory for errors. Command Prompt. This lets techies dig deep into Windows’ internal crevices. It’s designed for people comfortable typing in commands, not moving around a mouse. In short, the System Recovery discs return your PC to the state it was when first purchased, scrapping all your data while along the way. The System Repair disc, by contrast, offers tools to help bring your ailing PC back to life, keeping all your valuable files safe. When in trouble, always try your System Repair disc first, as it may solve your problem. Only use the System Recovery Discs as a last resort, as they wipe out everything you’ve created since buying your PC. Posted: December 21st, 2009 under Windows 7. Well, that was very helpful.. Thanks! Craig, make a System Image before reformatting your hard drive. Then, after the drive’s reformatted, restore your PC with the System Image, and you’ll be back where you started, with Windows, your programs, and all your files waiting for you. If you’re reformatting to wipe out a virus, though, then don’t use a System Image, as it might contain an infected version of Windows. Instead, use the System Recovery disc that came with your PC. That restores your PC to its purchased condition. You’ll still have to reinstall any new programs from their original installation discs, and restore your personal files from a backup. Clear concise and informative for those of who dont know much about computer language. Thanks. I’m trying to replace a failing Laptop HD. My computer is HP Pavillion I bought in 2009, Vista O/S that came with an upgrade to Win7. I obtained the upgrade disks and performed the upgrade to Win7, no problems, making System Recovery disks in Vista and a Win 7 Recovery disk as directed. I can’t get it to recover to Win7. Will I have to buy a Win 7 since this is a Hybrid, i.e. Original Vista, upgraded to Win7? Puzzled and frustrated and ready to hit it with a Sledge Hammer. Any advice appreciated, or am I wasting time??? Hugh — If I understand your post correctly, your laptop came with Windows Vista, and you upgraded it with the Windows 7 Upgrade disc. Then you made a Windows 7 System Repair Disk. 1. Use your Windows Vista System Recovery Discs to install Vista onto your laptop’s new hard drive. 2. Use your Windows 7 Upgrade Disc to upgrade Vista to Windows 7, just as you did originally. Yes, it’s a lot of extra work. But that should do the trick. I thought of backing up the whole of my hard disk on an external USB portable hard disk BUT I discoverd that I won’t be able to access that USB portable HD while on the System Repair CD, if I ever needed to restore my HD. Is there a way I can backup all of my hard disk on an external USB hard disk so that I can restore from there? Netzian, you can save a System Image to USB portable hard drive. The System Repair disc also lets you restore a System Image from a USB portable hard drive. Why do you think you won’t be able to access it from the System Repair CD? Carls, a Recovery Disk will wipe out everything — even personal data on another partition — and return your computer to its purchased state. If you want to save a partition containing your data, you should back it up. Since that partition only contains personal data, you can probably just copy all of its folders to a portable hard drive. (Or you can use a partition copying program like Easus Todo Backup Free). Later, after using the Recovery Disk, you copy that partition’s data from your portable hard drive backup over to your restored PC. So i recently did a clean install from vista to windows 7 and now im confused to as what i should do as far as a back up plan..so all my data and music is already on multiple devices since i did a clean install so not worried about that so much.. i just want to know best option for restoring computer if hard drive crashes..When i booted to windows 7 and custom install was complete there was no prompt for recovery discs which was the case when i first bought the laptop in 09 vista…I guess my question is since i have all my data stored already on other devices i just want to be able to restore windows 7 completely? Martin – Your best option is to to create a System Image from Windows 7’s Backup and Restore area in the Control Panel. When you create the System Image and the System Repair disc, you’ll be able salvage all your information after a hard drive crash. In case of a problem i should have added..I m actually looking at the text book windows 7 but doesnt realyy discuus recovery discs and if so is that even an option anymore in windows 7 verses vista? Martin – If you do a clean install of Windows 7 from a retail copy of Windows 7, you won’t have a System Recovery Disc. Instead, create a System Image and use Windows 7’s System Repair disc. Then, when your hard drive crashes, you can boot from the Repair Disc, and point the program to your System Image to bring your Windows installation back to life. Thanks for the post! I still have a doubt though. Suppose I have 10 PCs, fresh from the shop, installed with Windows 7 32bit OS. I create a System Image for each of the PCs. Is it enough for me to make one System Repair Disc for all the PCs? Or does each PC require a separate Repair Disc. I know the Repair Disc is specific for an OS. But is the Repair Disc specific to the PC? Priyanka – System Repair discs aren’t tied to individual PCs. In your case, you can create one 32-bit System Repair disc, and it will work on all ten of your Windows 7 32-bit PCs. The only thing that matters with System Repair discs is whether they are 32-bit or 64-bit. A 32-bit System Repair disc only works with 32-bit Windows 7 computers. Likewise, a 64-bit System Repair disc only works with 64-bit Windows 7 computers. Any 32-bit Windows 7 computer will create a 32-bit Repair Disc that will work on any 32-bit Windows 7 computer. Any 64-bit Windows 7 computer will create a 64-bit Repair Disc that will work on any 64-bit Windows 7 computer. Great article and now ‘get it’. However, not got an optical drive on my laptop, so how can I make a system repair disc? Tried accessing a shared DVD drive from another machine (works usually!) but seems the repair disc needs to be a physical drive on my laptop I’m trying to make the disc from. Simon: A Repair Disc can be made on any Windows 7 computer. Your best bet is to make your Repair Disc on Windows 7 computer owned by a friend or at work. However, since you’ll be unable to boot from a disc on your laptop, you should look into putting a repair disc on a bootable USB drive. I have two PC’s, purchased at the same time, which are the same specification apart from the motherboard. One is Asus while the other is MSI. They both came with a Windows 7, 64-bit O/S installed and have the same programs, files and folders. After a problem with the Asus PC I can’t start Windows and need to recover the HDD but I don’t have a system repair disc. I do, however, have one for the MSI PC (plus system image and file/folders back-up). Having read some of the comments plus answers I understand that repair discs are not tied to an individual PC and can be used on another PC with the same O/S (as long as both are either 32-bit or 64-bit in the case of Windows 7). If I use the MSI PC repair disc to recover the Asus PC HDD how do the Asus drivers get installed? Also, as the Asus and MSI drivers must be different will this procedure actually work? Paul – The Repair Disc provides a bare-bones version of Windows that doesn’t need drivers, much like running Windows in “safe mode.” That’s all your computer needs to be able to restore the System Image you’ve created earlier. Then, when you reboot, your computer has its original hard drive’s contents back, so all the drivers will be in place. I did not created recovery disc immediately after i turned on the laptop for the first time Lenovo win7 sp1, two years ago. Laptop is still in good condition and not infected by virus. Is it possible create recovery disc now? Shashank: Yes, you should still be able to recreate a recovery disc. You might also be able to order one from Lenovo’s website. However, since you’ve been using the laptop for two years, you should probably skip the recovery disc and make a System Image, as well. If you create and use a recovery disk, you’ll lose all of the work you’ve done for the past two years. A System Image, by contrast, will preserve all of the work you’ve done on your computer so far. If I don’t have the windows 7 repair disc, can I still boot and restore the computer with the Windows system image? An email response would be appreciated. Thanks. Joseph: No, you can’t boot from a system image. You need the Windows 7 repair disc. If you don’t have one, you can always make one from a friend’s computer that runs Windows 7. My computer did not come with a windows 7 disc. I want to format. Does the recovery disc do the same thing as a install disc. Is the recovery disc bootable? The System Recovery disc is bootable, but it only lets you restore your computer to its originally purchased state. If you just want to reformat your hard drive, you’ll be left with a blank hard drive. Is that really what you want? Without a Windows 7 disc, you won’t be able to reinstall Windows 7. Thanks for this. Does it need a periodic System Repair Disc or System Recovery Disc. I make a full back up every week using Paragon and Window backup. > Tony: I’m not sure what you’re asking. Can you rephrase it? 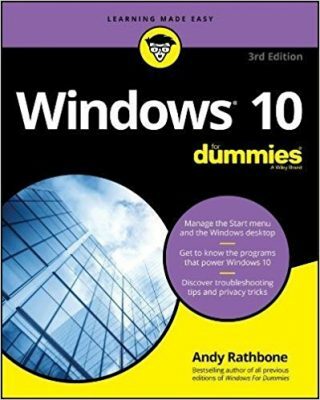 Still helpful info nearly 6 years after your original post, as I work to create recovery media for an old Win 7 laptop newly upgraded to Win 10. Thank you, Andy! on windows 10 control panel, a system repair disc can be made from’ back up and restore(windows 7)’Is this for windows 10 or only for windows 7? Jan: Although Windows 10’s menu says “Backup and Restore (Windows 7)”, that option only lets you use the backup and restore programs introduced in Windows 7. Some people prefer Windows 7’s backup programs, particularly its System Images, over Windows 10’s new File History backup. Using Windows 7’s backup tools will still backup your Windows 10 computer, though. It’s not a way of returning to Windows 7. Thanks for explaining Andy.I created a system repair disc wich is only 335mb.Is this a bootable disc incase my windows fails to boot? Jan: Yes, your System Repair disc is bootable and will give you access to some troubleshooting tools. Wow finaly a really step by step help i have needed in a long time. Been searching and searching the internet for weeks and not getting a full on easy to understand Help i have been looking for. Thank you very helpful. Hi Andy, I have an E-Machine T2742 that I think needs to be recovered. The 3 disks that came with the machine say Restore CD on them. Will I be able to get my machine running properly again with these disks? Also will I lose everything that’s already in the desktop? Thank you in advance for your help. Fran: Those three Restore CD discs will return your computer to the state it was in when first purchased. You will lose all of your files and programs installed since that point in time. If you’ve made a backup, you can then use the backup to restore everything contained in the backup. But without a backup, those Restore CDs will only bring your computer back to its factory condition. If you don’t have a backup, you might consider taking your PC to a repair shop. They might find an alternative that will save some of your files. great blog! truly informative and v. helpful. if i restore Windows 7 from “recovery discs”, i would be missing out all the “windows updates” since the repair discs were created. to bring the Windows 7 to its most current form, it would take hours (12-20 hours). is there a solution to this? can i create new “repair discs” so that some “windows updates” would be included since the original purchase date? thanks! Jay: If you restore Windows 7 from the computer manufacturer’s recovery discs, then your computer will return to the form it was in when first sold. That means you’ll spend many hours waiting for Microsoft’s updates to pour in to bring Windows 7 up-to-date. If you don’t want to wait for the updates, check out the ISO option; it might be preferable. Very helpful information even after eight years of publishing. I discovered recently that I had only been making copies of my system image files and backups regularly through Windows task scheduler but I hadn’t been making system repair discs. One day I was reading the fine warning messages throughout Windows built-in backup tools and it said a system image might not be enough to recover your PC from disaster and that a system repair disc might be needed. To think I’ve gone almost three years making backups without a system repair disc accompanying it. Luckily nothing’s happened in that timeframe but I’m glad I figured it out before disaster did strike and this article helped clear it up for me. Thanks. Joey: Glad to help. System Repair discs are pretty easy to locate. Any System Repair disc made by any Windows 7 PC will work on any Windows 7 PC. The discs aren’t tied to the computer that created them. Anybody who needs one can usually find a friend or somebody at work with a Windows 7 PC; that PC will be able to create a System Repair disc for them. If I have to use the imaging media to restore my computer, do I have to run the recovery media first or is it in the imaging media? If your computer can load Windows, you won’t need to use the recovery disc; you can restore from the system image from within Windows itself. If Windows isn’t running — or if you’re installing on a new, empty hard drive — you need the recovery disc. Your computer will load from the recovery disc, which offers you an option to restore from a system image. Thanks for the quick answer and all the helpful information above. Great Job!! I just got the blue screen of death on my very expensive 5 month old desktop! Luckily I had read your INCREDIBLY HELPFUL article two weeks ago and made not one, but two (just in case), System Repair Disks. I cannot thank you enough for 1) writing this article in a format easy to understand, but 2) keeping it posted all of this time. YOU ARE MY HERO!!! Mo: Yes, if you have a System Image of your computer’s system drive — the drive where Windows is installed — you can do those things.